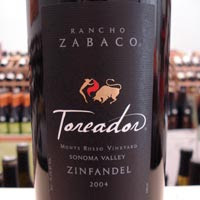 This has to be one of the very best Zinfandel's I have ever tasted. In fact I tasted this wine amongst five or six other heavy hitters at a private wine tasting and thought this was the wine of the night. It's not particularly inexpensive wine and it rolls in at about $5o a bottle, but it is a stunner in terms of quality. On the nose I got beautiful raspberry notes combined with caramelized pie crust with cream on top. This is sort of a nerdy description of how the wine smelt but I really think this is what the wine showed for an aroma profile.